Vacuum cleaners and regular cleaning solutions work well, but what works even better when cleaning your upholstery is a dedicated upholstery cleaning machine that combines the two. We’ve looked at the best of every size out there. Each of these upholstery cleaners is ideal for cleaning up food stains, marks from pets, or simply when the kids have decided to draw all over the couch instead of their coloring books. Consider them the best way to keep your furniture, carpet, and even car interiors looking as good as new. Here’s a look at the best wet upholstery cleaners out there. The Bissell Spotlifter Powerbrush Handheld Deep Cleaner is one of the simplest cleaners out there. Simply plug it in, fill it with cleaning solution, and you’re good to go. 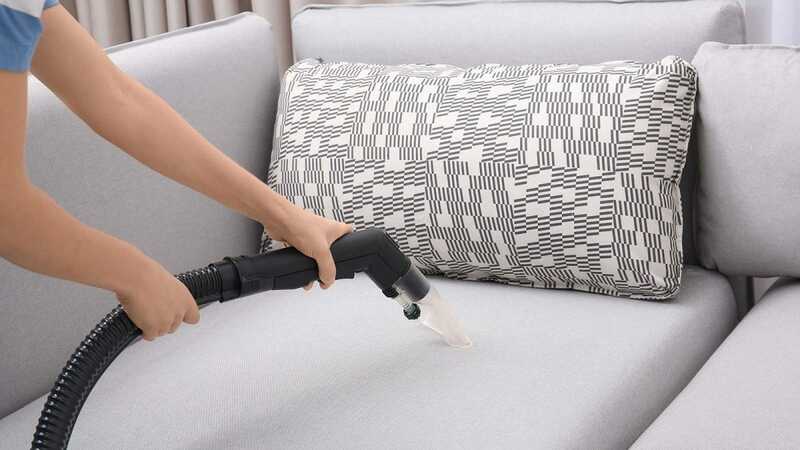 You hold it like a regular handheld vacuum with continuous suction ensuring that your surfaces don’t get too wet and that any dirt or stains are sucked up quickly. In addition to the continuous suction, there’s a manual spray trigger so you can opt to spray more solution onto the stain if need be. That’s great for digging up stubborn stains that don’t normally budge. A rotating brush further helps as it loosens up the dirt well before the suction does its thing. It’s all suitably effortless, right down to how easy it is to remove the water and dirty water tanks after use. Just slot them off the back. Prefer to use upright vacuum cleaners? 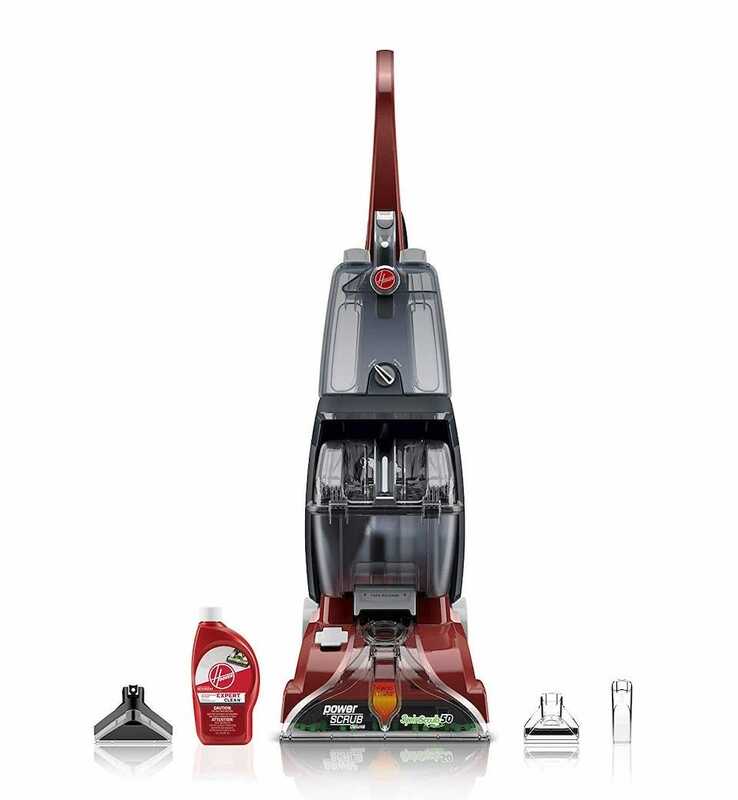 Then the Hoover Power Scrub Deluxe Carpet Washer is perfect for you. The powerful suction is combined with 360-degree brushes so it can easily contend with the toughest dirt on your furniture or carpets. Rather conveniently, it also has a special nozzle so it evenly cleans surfaces with equal amounts of suction, so you don’t have to worry about missing any key areas. As well as that, it applies forced heated air to your carpets and surfaces so that drying time is improved. No squelchy carpets to walk around thanks to this feature. Throw in automatic detergent mixing (and separate tanks for added ease), and it’s hard to pick fault in the Hoover Power Scrub Deluxe Carpet Washer. It’s perfect for an upright solution with a high quality hand-held feature built right in. For the price, it’s a ridiculously good value that will work on both your couch and your carpets. 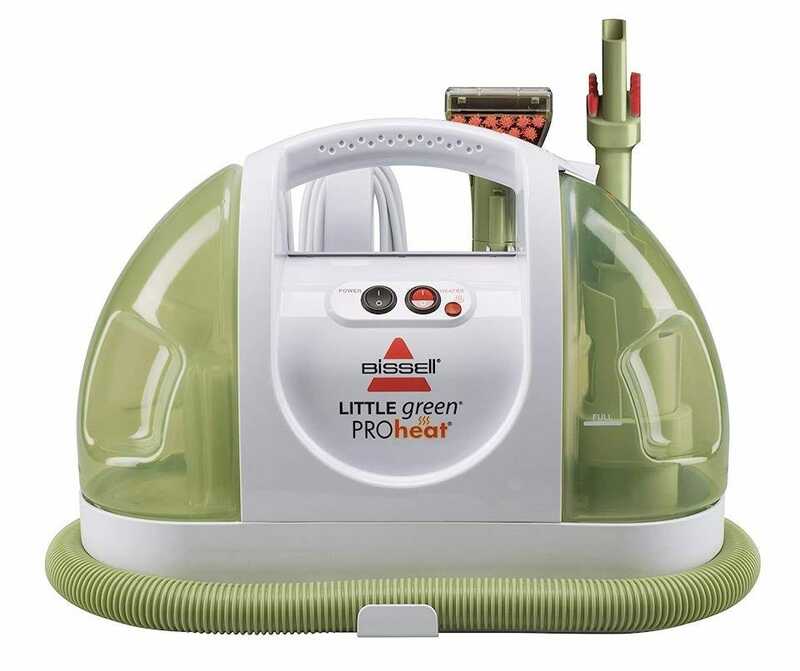 True canister based upholstery cleaners are rarely hugely effective but the BISSELL Little Green ProHeat Portable Carpet and Upholstery Cleaner is pretty great. You can carry it or drag it around, using the pull out hose to get to the parts of the furniture other cleaners can’t reach. It’s fairly lightweight, weighing 13lb, with the hose stretching to 4 feet so it’s good for it all. 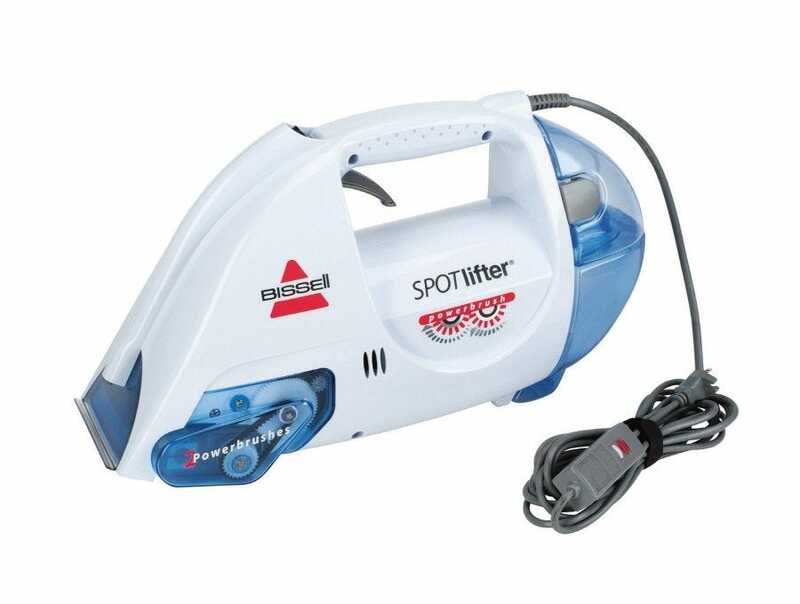 The cleaner offers a powerful spray as well as suction so it easily lifts up stains and dirt off surfaces. There’s a built-in hot water heater too for better results, along with all-important separate clean and dirty water tanks. Extra tools include a tough-stain brush as well as a spraying crevice tool for awkward corners. If you regularly drop food on the couch, or you have a pet who’s still working on house training, this is a good solution. 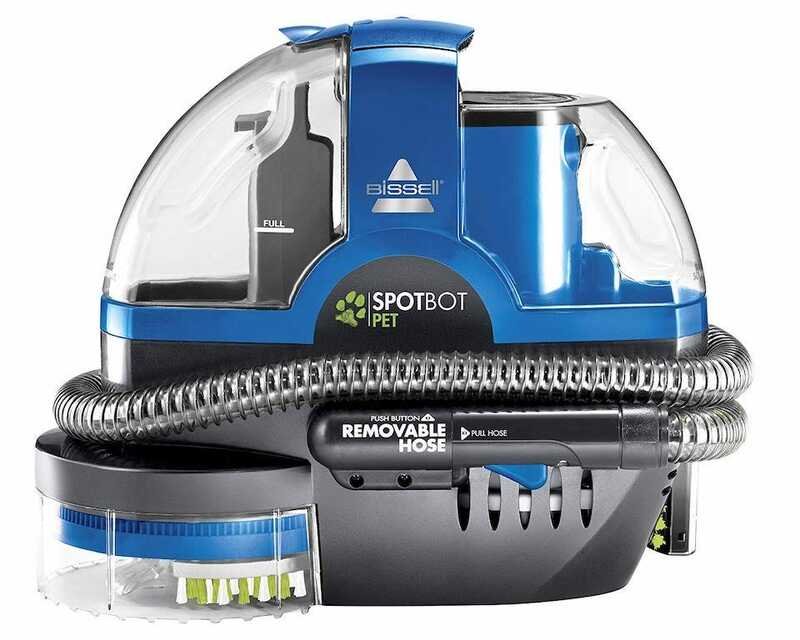 If your pet isn’t exactly the cleanest then the Bissell SpotBot Pet handsfree Spot and Stain Portable Deep Cleaner is the device for you. It has the usual hose, tough stain tool, and stair attachment, but it also has one killer feature—a hands-free mode. You can simply set the cleaner to an automatic cycle then walk away while it does the rest of the work for you. It’s likely you’ll be cleaning something a little disgusting if you’re tidying up after pets so this is an awesome way of avoiding getting too close to whatever has occurred. It’s good at deep cleaning too so you’re sure of remarkable results afterwards. That’s thanks to it completing over 400 cleaning revolutions when placed on deeply ingrained stains. It’s expensive but far cheaper than replacing carpets and furniture, all because of stubborn or unpleasant stains. If foam rollers or massage sticks aren’t enough for your muscles, check out percussion massagers—they not only get those deep knots with a variety of vibrations and rapid movements, but they can also give you a professional-feeling massage right from home. Planning a trip can be complicated and juggling flight reservations and hotel bookings is often only the start of it. Fortunately, there are apps out there to take the stress out of things. Here’s the best of the bunch to help make trip planning painless.